A little slice of Heaven is waiting for you at Hank and Grace's Hideaway at Pinnacle Port! We offer you a bargain without sacrificing beauty. Why pay higher prices on 30A, when you can stay with us and enjoy the beaches of 30A and Panama City Beach! The location is overwhelmingly beautiful. It is right on the beach inside the Carillon Beach / Pinnacle Port gated community which is composed of expensive Victorian style beach homes. Our condo is in the tower on the 1st and 2nd floors at Pinnacle Port, one of the most beautiful gulf front condominium complexes in the Panhandle. This is a great place to spend a vacation, honeymoon, anniversary, or have family fun! 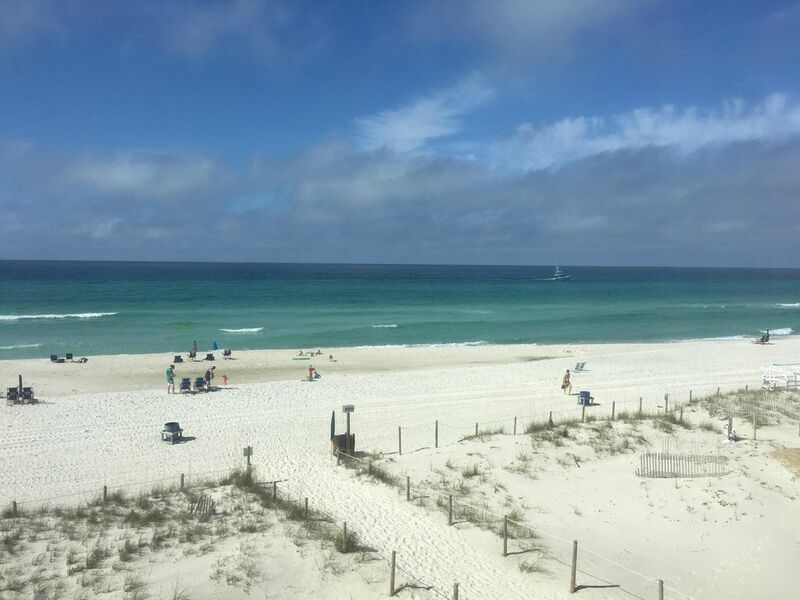 We offer you this beautiful spot beside the beach at a price that will not destroy your budget, but leave room in it for you to have money to eat out, shop and enjoy all the activities available at Panama City Beach and 30A. For $1489.60 per week (this includes 12% tax) during peak summer season, plus an additional clean up fee of $85, you can enjoy what others would pay much more for. Shorter or longer stays are available as well. Off season rates and booking information are listed later. Our possible two bedroom unit at a one bedroom price is an opportunity that we are offering to those who love the beach. In order to convert this one bedroom unit into a two bedroom unit, we provide a queen size Murphy bed in the living room that lets down into a comfortable bed. Our beach front condo has been newly remodeled with new carpet and professionally repainted throughout. We have all new linens, towels, bedding, and pillows. We have also updated the lighting throughout the condo. We have original artwork throughout the condo by artist, Grace Russell including a beach mural in the half-bathroom. Please view our photos as they have been updated since Hurricane Michael. To get to our condo, use the elevator or stairs on the ground floor in the main tower at Pinnacle Port and go to the 1st floor. Our condo is A-118. The master bedroom which looks out onto the beach / ocean is located on the 1st floor along with the master bathroom. On the 2nd floor, the dining room also looks out onto the beach / ocean and the shaded balcony off the living room has a spectacular view of Carillon Beach and Panama City Beach from Pinnacle Port all the way to Thomas Drive. The balcony has a table and chairs if you enjoy outside dining. At Pinnacle Port, you have the best of both beaches! 30A, Rosemary Beach, Inlet Beach, Seaside, Watercolor, Seagrove Beach, and other interesting seaside villages with shops and restaurants are just 2.4 miles to the west (4 minute drive). For Destin, we are only 30 minutes away from Silver Sands Premium Outlets, one of the largest outlet malls in the country. For Panama City Beach, Pier Park, the newest shopping village at the beach offering numerous department stores, small shops, restaurants, and a 16 screen movie theater is only 8 miles away to our east (14 minute drive). There are lots of things to do at Panama City Beach for the whole family. Gulf World offers a chance to get up close with sea life. Publix and Winn-Dixie grocery stores, CVS Pharmacy, Wachovia Bank, several restaurants (Bayou Bill's Crab Shack, Bubba's Pizza, Shade's Bar and Grill, Cuvee 30A, Dunkin' Donuts, etc...) and various shops are a short drive away and restaurants at Carillon Beach are within walking distance. A number of excellent golf courses are available nearby. Parasailing, deep sea fishing and many excellent restaurants and shops are nearby, but the relaxing beauty of the white sand and emerald green water within the Carrillon Beach/Pinnacle Port gated community remain the greatest attraction. My name is Leigh Ellen Atkins. I am the granddaughter of Hank and Grace and property manager of Hank and Grace's Hideaway at Pinnacle Port. I have been managing the condo since 2014 and have been enjoying going to Pinnacle Port since I was a child! Hank was a retired United Methodist Minister. Grace was a writer and artist. They have 5 children, 17 grandchildren and 19 great-grandchildren whom love Pinnacle Port and have spent many a happy vacation at our condo. All of them love the beach. The great-grandchildren say, "That's really my beach" to which the others reply, "No that's really my beach, I just let you come, too". If you want to have a fantastic family vacation, this is where to have it! We love the beautiful white sand and turquoise water of the Gulf. We also enjoy seeing the many different types of marine life such as dolphins, manta rays, sea turtles, pelicans, sea gulls, crabs, fish etc.... Panama City Beach and 30A are within easy driving distances of our condo. My grandparents hosted many friends here and enjoyed spending the winters here. Gulfview United Methodist Church is nearby and they enjoyed their fellowship a lot. We love the location of our condo! Pinnacle Port is a private, gated resort, offering luxury and comfort right on the Gulf of Mexico. It is close to Panama City Beach, Inlet Beach, Seaside, and Destin. Also, a lot of condominiums have long boardwalks to the beach, but Pinnacle Port does not. It is one of the few condos where you can walk directly from the building onto the sand. 3 telephones are available for local calls only. New linens (bath towels, hand towels, washclothes, rugs, and sheets) have been added to condo. Bring your own beach towels. You will need to bring your own detergent. Free Wifi is provided during your stay. New coach and recliner added in 2017. New Coffee Maker added in 2016. Keurig Coffee Maker added in 2018. New stainless steel toaster added in 2017. 39' Flat Screen HDTV in living room and 32' Flat Screen HDTV in bedroom. Network Communications is our cable provider. Nearby Publix and Winne-Dixie have Redbox for Blueray and DVD rentals. A new patio table was added in 2016 and several chairs make it possible to dine on the balcony with a beautiful view of the length of Panama City Beach from Carillon Beach to Thomas Drive. There is one balcony off the upstairs living room. 4 Tennis courts are on the property for your use. Pinnacle Port has both a men's and women's sauna and showers located behind the indoor/outdoor pool. Pinnacle Port has an indoor/outdoor pool attached to the main building where our condo is located. Another outdoor pool is located by the 4 lighted tennis courts and playground. Best little condo on the beach! This was our second visit to Hank and Graces and it was perfect! The condo has everything you need and the location couldn’t be better! We will definitely be back!! My husband and I enjoyed our stay at the Hideaway. Such a great name for the condo. We loved the layout and the deco. Would definitely stay again. Beachhouse Charm with all the Amenities! We really enjoyed our stay at your condo. Convenience to the beach, and an easy drive to local attractions, shopping and dining. It was very clean and provided everything we needed. We loved the gated entry and wonderful atmosphere. Greatest View on The Beach!!! We have been staying at Pinnacle Port since our oldest child was four. We now take our four grandchildren and expose them to the GREATEST family atmosphere on the beach. There is more for children of all ages to do and have a Grand time. It is near good food, shopping, night life, fishing, etc. Youi can't find a better place to stay. We will be returning again this summer for more fun with our grandchildren!!! Clean, great access to the beach. Well supplied. My husband, preteen daughter and I had a great 4 night stay at this lovely condo. It was the perfect size for the 3 of us. The murphy bed upstairs is an excellent perk allowing everyone to have their own space when needed. The view from the dining room and downstairs bedroom is amazing and the condo is only steps to the beach. We would definitely stay here again. The Cleaning Fee of $85.00 (for 1-4 people) or $95.00 (for 5-6 people) is payable at checkout at the condo.